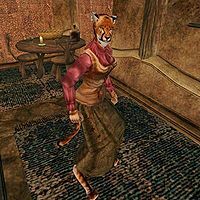 Tsiya is a Khajiit commoner and skooma-addict living in Balmora. Her friend Ernil Omoran has disappeared, and you can help her out by discovering what happened to him. In return, she will give you a free place to stay in the city, along with a little money and ten portions of moon sugar. She is wearing a common shirt with matching skirt and amulet and carries three bottles of skooma. Like all Khajiit, she can see well in the dark and can demoralize others for short periods, but otherwise knows no spells. She lives in a two room, two story house in the middle of Balmora. She has a hammock for a bed and a few tables and counters filled with clutter scattered around her house. The only item of note is a bottle of skooma hidden in the second floor, on a counter behind a yellow glass bowl. "You've got a note from Ernil for Tsiya? That's odd...Tsiya was expecting him here any day now. He's dead? Oh, no. Ernil was a good man, and always dealt fairly. Tsiya doesn't suppose you found anything he might have been delivering to Tsiya did you?" Yes, there was something on the body that might have belonged to you. [Tsiya's Skooma Pipe has been removed from your inventory. 50 Gold has been added to your inventory. 10 Moon Sugar has been added to your inventory. Note from Ernil has been removed from your inventory.] "Oh, this. Well, this was really for a friend...never mind. Thank you for returning it. Tsiya can't imagine you care whose it is. In fact, take this. It was supposed to be Ernil's when he brought Tsiya these things." OR [Note from Ernil has been removed from your inventory.] "Ah, well, it's a shame you didn't pick up that skooma pipe. No need to skooma-coat what it was. Tsiya was looking forward to getting her pipe. Well, thanks for the information." "Yes, thank you for the note. Tsiya will miss him." "Yes, well, Ernil was supposed to be delivering that to me. Would have been nice to have." [Tsiya's Skooma Pipe has been removed from your inventory. 50 Gold has been added to your inventory. 10 Moon Sugar has been added to your inventory.] "Oh, you've found it! Excellent. Here's a little something for you. It was supposed to be Ernil's when he got here. Tsiya would appreciate it if you'd keep quiet about this. You understand, yes?" "Good to have it back. Thank you." "What do you mean you're looking for me? I don't know you, do I? You say you have a note from Ernil?" This page was last modified on 9 September 2016, at 17:16.